Anthony Lovato’s jewelry and metalwork is formed by tufa casting. The whole design has to be done backwards. After the silver is melted and poured the design becomes a positive image on the silver with fine sand grains as a natural texture to my silver work. The silver/gold jewelry made starts and comes from mother earth. The tufa sandstone is found on the Hopi Reservation in Arizona, the rough blocks of sandstone is brought back to his home at Santo Domingo Pueblo. Anthony Lovato is a member of the Corn Clan and uses corn imagery in much of his work. Most of his jewelry designs go back to nature. 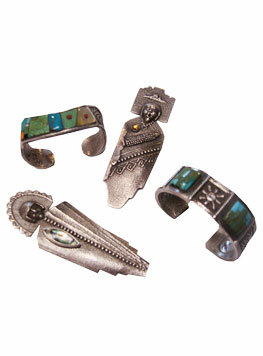 Desert Son of Santa Fe carries Anthony Lovato jewelry. Contact our shop for inquiries on our current inventory.